I recently purchased Tim Holtz' Stacked Words/Valentines die so it was fresh in my mind - and proved to be perfect for this challenge! I die cut the words in black and red, layered them over the white panel, popping one over the other with foam tape. And there you go - clean and simple - n'est-ce pas?? I have had such fun being the Guest Designer for January - thanks so much to the ATCAS team for inviting me to join in this month! What does 'Hugs and Kisses' inspire you to create? Can't wait to see what you link up over at the ATCAS blog! Accessories: Stacked Words/Valentines die - Alterations/Tim Holtz, foam tape. 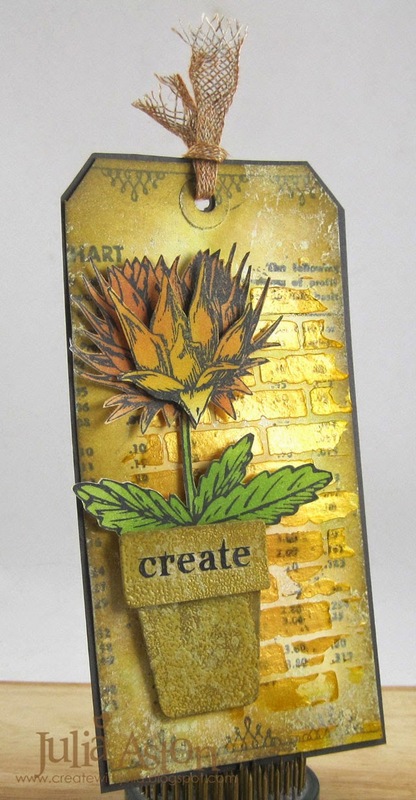 There's a new Blog Challenge out here called Make Art - celebrating all things Wendy Vecchi. 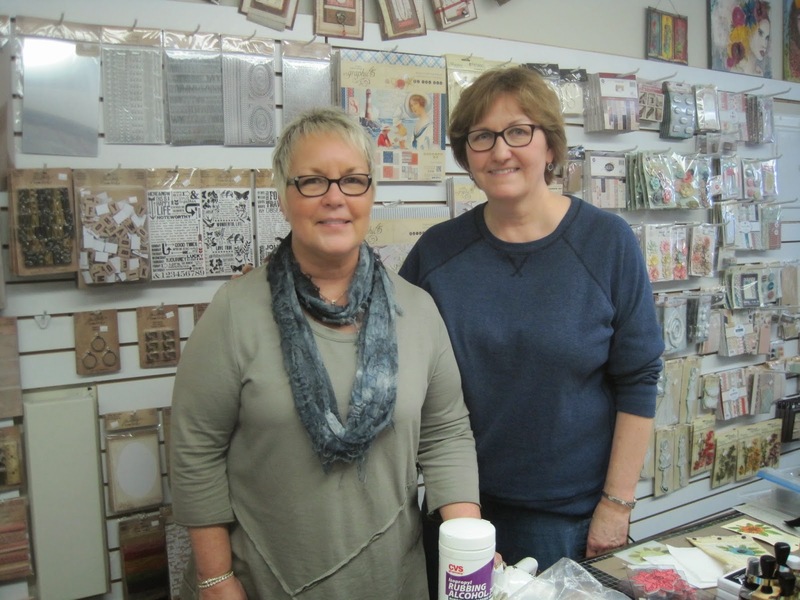 She is a designer of stamps and products for Ranger - and I have been a devoted fan ever since I took a class Wendy taught at Kim's Eclectic Paperie shop (Kim has closed the brick and mortar shop but still operates the web store!) 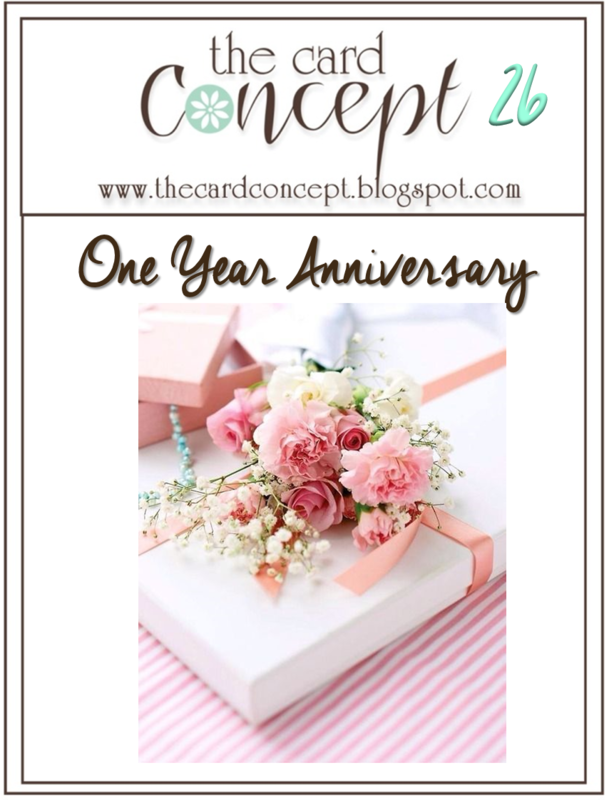 And Eclectic Paperie is sponsoring the very first challenge so be sure to check it out! So - the first challenge is to use embossing paste. I decided to make a tag for my project. I used Wendy's Splattered Plaster technique for the background on my tag which involves rubbing inks across your nonstick craft mat (I used Leaf Green and Tree Branch) splashing a lot of Rubbing Alcohol over the inks and mixing with a pallet knife, then spraying Picket Fence Spray Stain once over the mix and then dragging your tag through it - you will find Wendy's tutorial for this technique here. 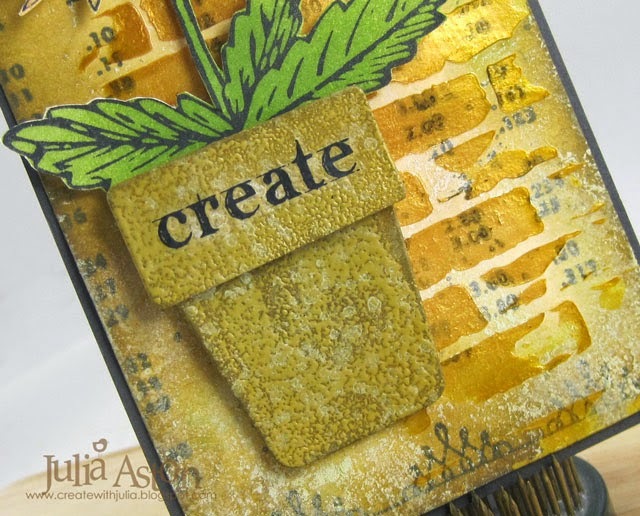 Next I used Wendy's Metallic Gold Embossing Paste with her Basically Bricks Stencil - covering just a portion of the area of my tag. After the paste dried (helped along with my heat tool!) I stamped the lace from The Beauty of Art set along the top and bottom of the tag and the Vintage Pricing Chart over the embossing - using Watering Can Archival Ink. 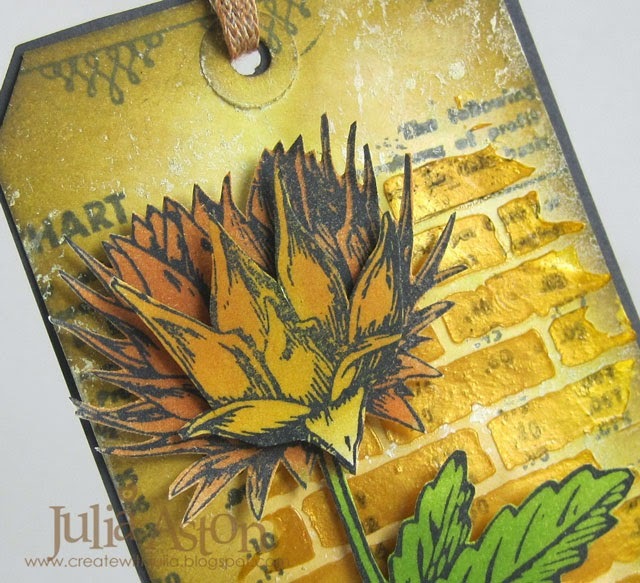 I stamped the flower, also from the Beauty of Art set on white card stock with black ink, sponged over it with Orange Blossom and Leaf Green inks and cut it out close to the edges. I stamped the bloom again, sponged it with Dandelion ink, cut out just a portion of it and layered it over the first flower with foam tape. I don't have Wendy's new little flower pots - yet! but I do have Flower Pots Nestabilities so I cut one out - altering it to layer the rim over the base. I inked the pieces with Tree Branch ink then embossed them with Tree Branch Embossing powder. Then I stamped over them with the Spatter stamp in Snow Cap Ink (Wendy's Faux Graniteware technique). I added a Remnant Rub/Botanicals to the pot. 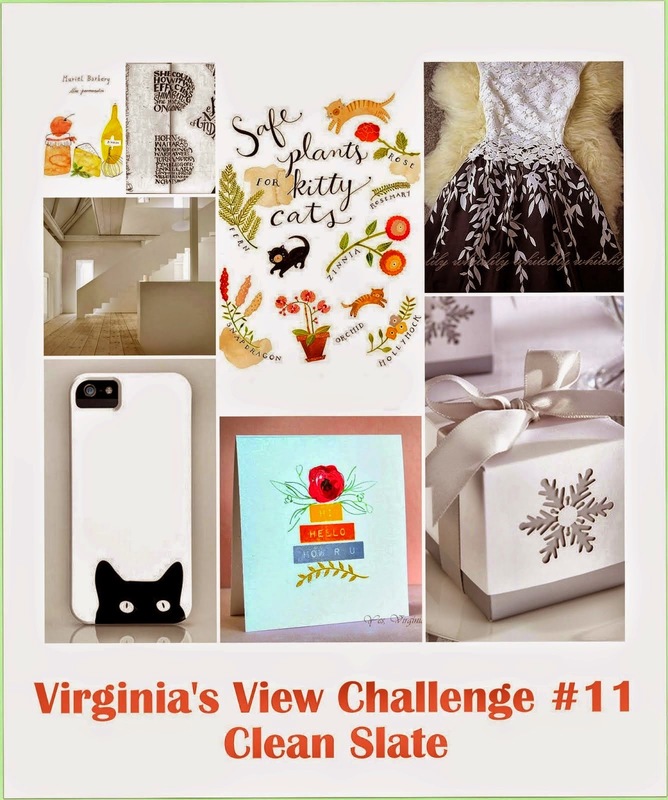 I hope you will check out this fun new challenge blog and join in on the fun - there will be a new challenge the first Thursday of each month. Here's Wendy and me at the class I took with her. Stamps: The Beauty of Art, Spatter Background, Vintage Pricing Chart - Studio 490 Wendy Vecchi. Ink: Wendy Vecchi Archival Leaf Gree, Tree Branch, Orange Blossom, Dandelion, Watering Can, Adirondack Snow Cap. Accessories: Nestability Flower Pot die, Tree Branch Embossing Powder - Wendy Vecchi, Linen Ribbon and Remnant Rubs/Botanicals - Ranger, Picket Fence Spray Stain, Rubbing Alcohol. Another Christmas card today - using a lovely stamp set from Waltzingmouse called Alpine Christmas. A simple design using Festive Berries Distress Ink and white card stock. I love this little village nestled beneath the giant Alps - The alps is one stamp, the cluster of houses is another stamp and the trees are another stamp in the set - so it's easy to ink them in different colors, but today I used just red. I used a Lil Inker Design Stitched Mat Rectangle to cut out the images and layered it over the card base with foam dots. I scattered 3 sequins around the card and stamped the sentiment at the bottom. 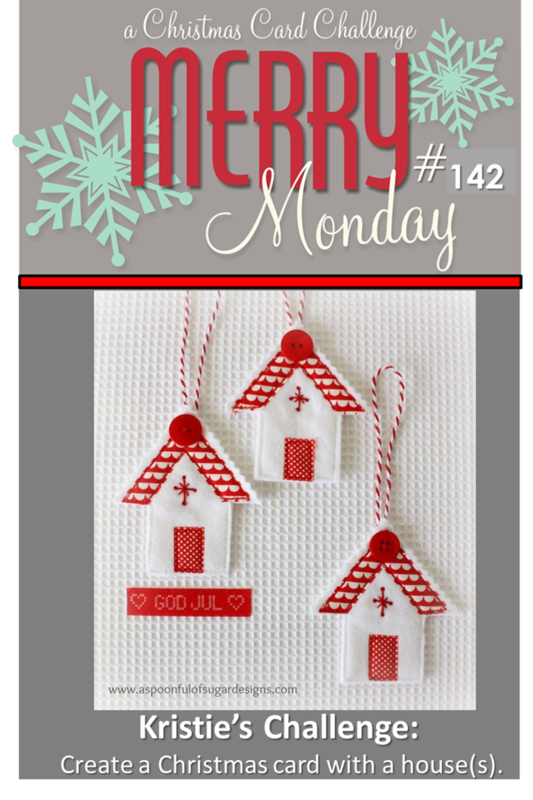 My card was inspired by this week's Merry Monday Challenge - create a card with a house on it. I'm getting this in just under the wire! Thanks so much for stopping by today! Accessories: Stitched Mat Rectangle Dies - Lil Inker Designs, Sugar Blend Sequins - Avery Elle. I decided to use Tim's fun In the Bag die to create two vintage looking Valentine treat bags that I will give to two special people in my life, with a little gift tucked inside. I die cut one bag out of Kraft Cardstock and one bag out of red Coredinations/Kraft Core. I used two different pieces of Valentine papers from Tim's Seasonal Paper Stash for the front and back panels of the bags. I stenciled over the black and white Valentine advertising paper that I used for the kraft bag with Tim's Latticework Stencil and Worn Lipstick Distress Ink sponging the edges with Tea Dye. I die cut the cupids and hearts using Tim's Mini Love Struck Mover's and Shapers die. I used Wendy Vecchi Metallic Gold Embossing Paste on one set - and Art Anthology Stone Effects paint in red and stone on the other set. After they both dried - I put on a coat of Clear Rock Candy Distress Crackle Paint. I put a coat of the Clear Rock Candy crackle on the Alpha Chips but it chipped right off after drying (I guess it needs some kind of basecoat in order to stick?!) so I just painted the edges of the letters with Picket Fence Distress Paint. I die cut the XO using Tim's Stacked Words/Valentine's die out of a piece of black Coredinations Kraft Core and sanded it so the kraft showed through in some places.. I adhered some Industrious Stickers/Borders under the edges of the panel so they stick out beyond the edges of the little bag. I added a Remnant Rub/Words over the LOVE. I twisted tan and red Jute String together and knotted the ends through a hole in the side of the bag for a handle. I rubbed Picket Fence Distress Paint and Pumice Stone Distress Ink over the crackle on the heart and cupid with my finger. I did a simple back panel using the same paper, stencil, ink and Industrious Stickers. I used a colorful piece of Seasonal Paper Stash of vintage Valentine post cards for the front and back panels. I inked the Industrious Stickers frame with Wendy Vecchi Archival Orange Blossom Ink. I painted Wendy Vecchi Mettalic Gold Embossing Paste on the cupid and heart. After it dried, I covered them with Clear Rock Candy Distress Crackle Paint. I used some Remnant Rubs/Words on the heart, wing and bottom corner of the panel and a Chit Chat Sticker in the top right corner. I used a piece of Linen Ribbon for this handle pulling apart the ends (love that look!). I used the same paper and inked Industrial Stickers on the back. I think these make really 'sweet' Valentine Treat Bags! I hope you will join us at A Vintage Journey by creating a project for Astrid's Love is in the Air challenge! Our challenge sponsor is Country View Crafts. They are offering one winner, chosen by the Creative Guides, a £10 voucher to spend in their on-line shop. 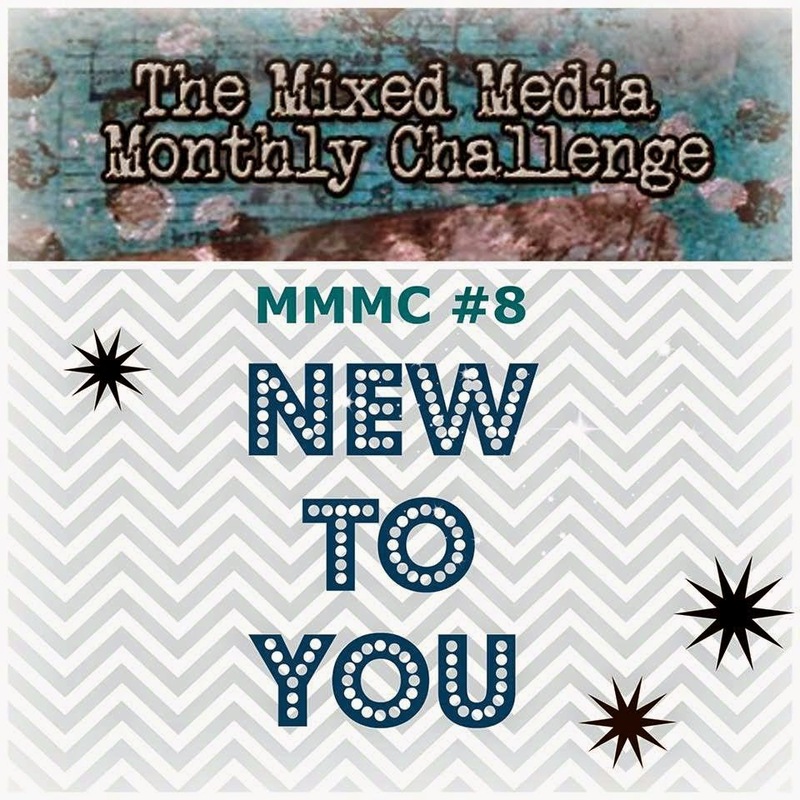 I'm also linking my project to the Mixed Media Monthly Challenge - although I've had the In the Bag die for some time - I have never made a project with it!! Yes - I'm in the Valentine mode - getting cards made for our sale at church coming up soon. Here's my latest creation. I was inspired by the latest My Favorite Things Sketch - and used several MFT products - stamps from Distressed Hearts (a stamp set designed by my talented friend Mona! ), dies that co-ordinate with the stamps, and the Hugs and Kisses Cover up. 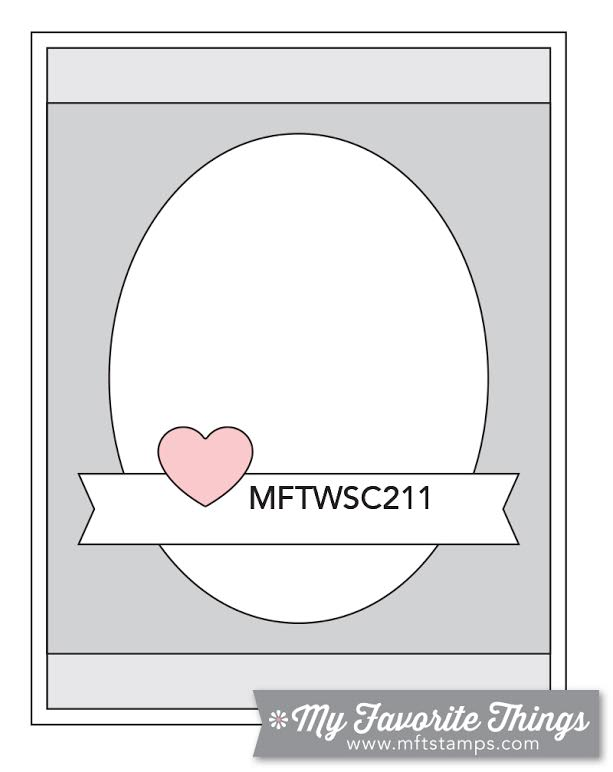 There's still a couple of days to get your sketch card linked up over at the MFT Card Challenge blog! Hope to see you there! 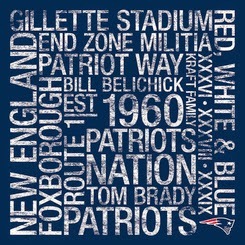 Meanwhile - Kent and I will be on the sofa at 6:30 pm tonight hopefully watching the Patriots win the football game so they'll be in the Super Bowl on Feb 1st ..... GO PATS!!! Accessories: Distressed Hearts Frames Die set, Hugs and Kisses Cover Up - MFT, Stitched Mat Circle die - Lil Inker Designs, foam dots. Addicted to CAS - Guest Designer for January! I'm so excited to reveal today that I have been invited to be the Guest Designer for January over at the Addicted to CAS challenge! We've got Big Ben in London, The Chrysler Building in New York City and the Eiffel Tower in Paris - so this represents many parts of the WORLD - there's also the cute little NYC taxi cab to drive you around the WORLD and the fun passport sentiment (a little wood mounted stamp from Uptown Design that I've had for ages, I think they are out of business). Big Ben and the Chrysler building each have two stamps in the set (outline and background) so it's easy peasy to stamp them in two colors and having the dies means you get them cut out with one little roll of the die cutting machine! I layered all the buildings on one side to leave lots of white space on my CAS creation. So - how do you see the "WORLD"??? I hope you'll link up your creations over at Addicted to CAS! and I'll see you again as Guest DT for the January 31st challenge! Stamps: City Scene - PTI, sentiment from Uptown Design Co. Ink: Momento Tuxedo Black, Peanut Butter and Olive Grove. Accessories: City Scene Die Collection - PTI, foam tape. I finally dragged out my Make It Market Shakers and Sprinkles kit that I purchased from PTI in April 2014 when it came out (and haven't used until today!) and made 3 fun shaker Valentine cards! The heart dies, the patterned paper, the clear cardstock and adhesive foam comes with the kit. The Sentiment Strip is a die from MFT and the stamps I used are from a new PTI set called Love You to Pieces Addition Set. The Market Kit came with stamps - but they are not Valentine related. Betsy Veldman, creator of this fun kit, has a great tutorial post on the best way to assemble the shakers. I die cut the heart and circle sprinkles inside the shaker using two dies included in the kit - I also added one little shake of some clear crystals also included. I had so much fun putting this together - I made 2 more for our Valentine sale at church coming up. 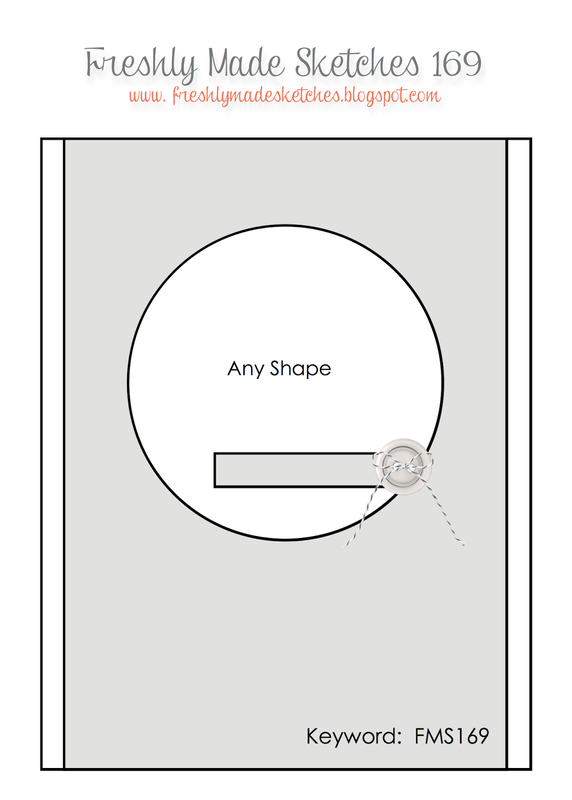 The clear cardstock causes a little static electricity and so the paper hearts and circles stick to it. You can shake them down - but it looks kind of fun with the pieces staying all over the front of the heart! Here's what I did on the inside of the cards - a simple sentiment (unknown maker) and 3 little hearts left over from the 'sprinkles'! Stamps: Love You to Pieces: Additions Set - PTI, Happy Valentines Day - unknown. I was inspired by the photo this fortnight. 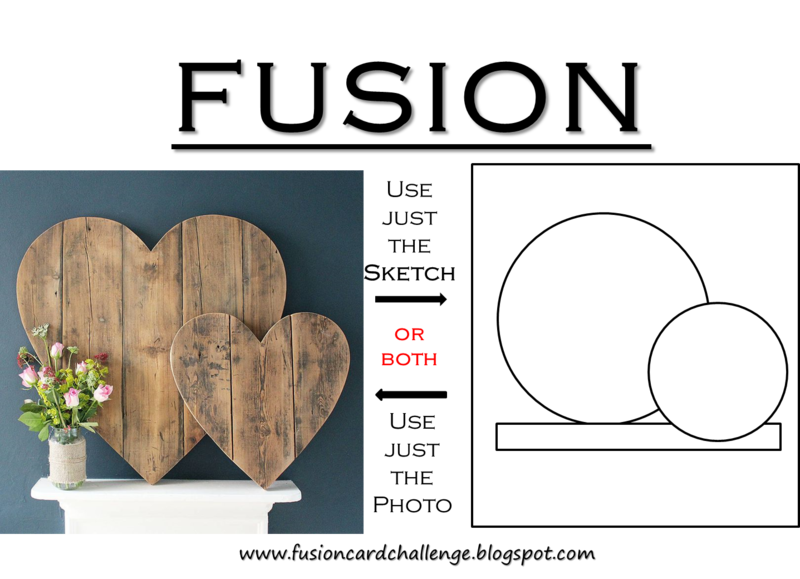 I had this wonderful Barnwood paper that was perfect for the heart shape. 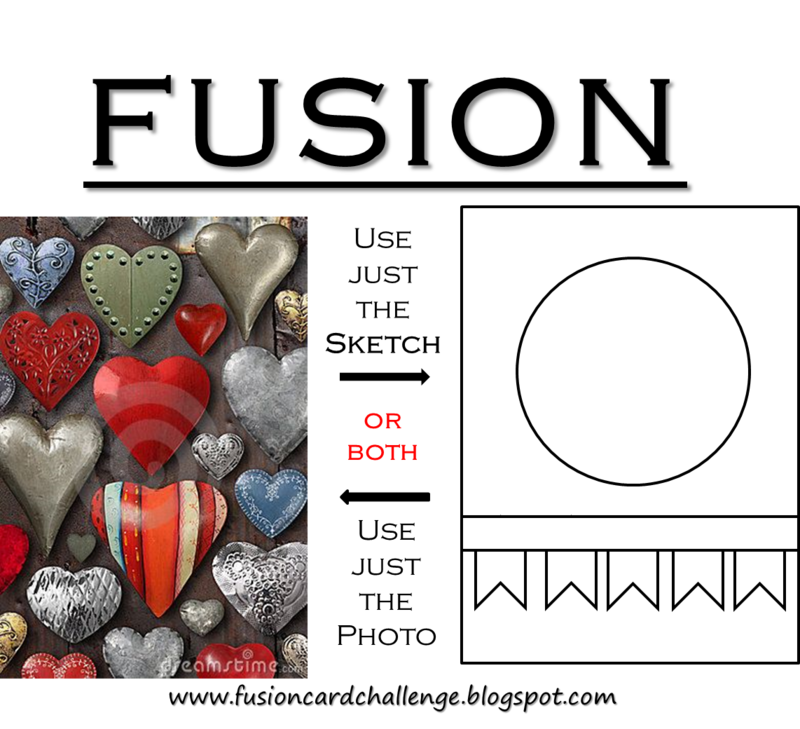 I used a Wendy Vecchi Large Heart Stencil to trace my heart - cutting it out of the patterned paper as well as cardstock - which I adhered together so the heart was sturdier. I sponged the edges with Walnut Stain Distress Ink and layered it to the card with foam dots. The XO is a die cut from the Stacked Words/Valentines die from Alterations/Tim Holtz. The XO is also up on foam dots. Then I just added 3 home made enamel dots. It was hard for me to leave that bottom right corner 'naked' but anything I put there didn't look balanced - so I stood strong and walked away from the card! LOL!! I'm presently making cards for a Valentine Sale at my church in Feb - so while I had everything out - I made 3 more cards using all the same supplies. I thought this one with the 14 die cut would be great for a teen boy or older male when you want to send a Valentine but you don't want it to be too mushy! Here I used the same die cut as my first card but a different lighter background paper. And here's another one of the die cuts from the die strip and a different background pattern. I also forgot to sponge the edges of the heart (Oops!) - so the edges aren't as defined. 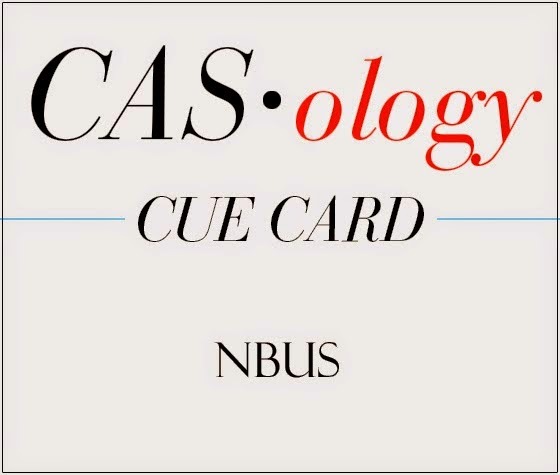 And a final shot at the whole group of cards! You'll find all the challenge details, some incredible inspiration from the Design Team, as well as the link-up for your creation over at the Fusion Challenge blog. Paper: white, True Black, Pure Poppy - PTI, DP - Barnwood/Paper Pizazz and Country Boutique Paper Pad/Fancy Pants. Ink: Ranger Distress Walnut Stain. Accessories: Stacked Words/Valentine die - Alterations/Tim Holtz, Large Heart Stencil - Wendy Vecchi, home made enamel dots, foam dots.